The Health Insurance Portability and Accountability Act of 1996 (HIPAA) is a complex beast in the world of HR. Lawyers and HR professionals are among the few who are equipped to understand what this law requires and to whom those requirements actually apply. To that point, the law is limited to three separate “classes” of entities, each of which having somewhat different duties to safeguard protected health information. Those classes are Covered Entities, Business Associates, and Subcontractors. Is your business properly classifiable as one of these three entities? The three types of HIPAA regulatory obligations with respect to use and disclosure of protected health information (“PHI”) and electronic protected health information (ePHI) are “Privacy”, “Security”, and “Breach Notification” – and Covered Entities are subject to all of them. Is more or less a “damage control” requirement that Covered Entities give notice to individuals, the Department of Health and Human Services, and the media, in the event of any unauthorized acquisition, access, use, or disclosure of PHI or ePHI. Following the rule of three, a Covered Entity will be either a health plan, a health care clearinghouse, or a health care provider. The government’s Centers for Medicare and Medicaid Services offer a flowchart to help determine if an entity may be one of the previously listed types of Covered Entity. For now, the category health plan lists: health insurance companies, health maintenance organizations (“HMO”), Medicare, Medicaid, or other government health programs, and employer-sponsored group health plans. NOTE: An employer that sponsors a group health plan, will not be bound by HIPAA as a covered entity unless the employee carries out administrative duties for the plan. For example, say an employer runs its own wellness program- if those duties involve the employer’s access to information that is “created, received, or maintained in connection with an employer’s group health plan,” then the Privacy (PHI) or Security (ePHI) rules will apply, as well as HIPAA’s non-discrimination rules. For insight into what qualifies as “PHI,” or “ePHI,” please refer back to our previous article regarding the maintenance and confidentiality of medical information and records. Covered Entities rarely work alone, and oftentimes enter into agreements with other entities, which, at times, can come into possession of the covered entities’ PHI or ePHI. Those contracted entities are known as “Business Associates,” and they too fall under part, but not all, of HIPAA’s regulatory structure. A Business Associate is directly responsible for compliance with some of the Privacy requirements, and all of the Security requirements, and may be directly or indirectly responsible for compliance with the Breach Notification requirements. Private couriers and their electronic equivalents are not Business Associates. Although they transport information, they do not access it, except on a “random or infrequent basis as may be necessary for the performance of the transportation service, or as required by law”. Janitorial or cleaning services whose employees may be disposing of a wastepaper basket in which may be PHI are not Business Associates for very much the same reasons; however, a document or media shredding company would be. 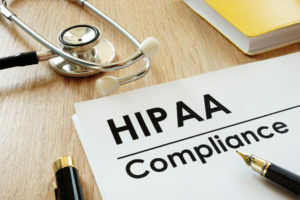 Covered Entities are required by law to compel any Business Associates with whom they deal to enter into a “Business Associate Agreement”, setting forth each party’s obligations under HIPAA. What’s important to remember is that it is the act of creating, receiving, maintaining, or transmitting PHI or e-PHI that makes an entity liable as a Business Associate, regardless of whether or not there may exist an actual Business Associate Agreement. HIPPA obligations “flow” downstream from Covered Entities to Business Associates to Subcontractors, who themselves become Business Associates by having created, received, maintained, or transmitted PHI or ePHI on behalf of other Business Associates. If you are an employer with questions about this or any issue relating to safety, human resources or workers’ compensation, contact East Coast Risk Management by calling 724-864-8745 or emailing us at hrhelpline@eastcoastrm.com.